How was your weekend? Mine was short and cold, lol. I had a makeup gig yesterday doing makeup for a sweet sixteener's invitation shoot. She is planning on doing an Al Capone/Gangster theme and was shooting pictures for club flyers/birthday invitations. It went well and she booked me for the night of her party. They're trying to get MTV involved to film it for My Super Sweet 16...hopefully it's a go so I can get on tv, he he. 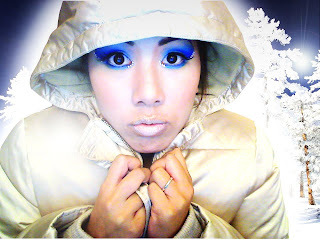 Anywho, my girl Mayaari recently hosted a winter challenge for her 1 year blogaversary. Yay! 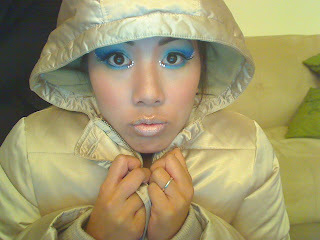 I wanted to try out the Snow Princess looks since I really don't do a lot of icey looks. First off, I used a porcelain colored foundation to completely wash out the color of my face and to mimic that "snow white" look. You can see the difference by looking at my face and hands, lol. To give myself a little color, I contoured my cheeks and nose with coppertone blush, which gave me a healthy flush. 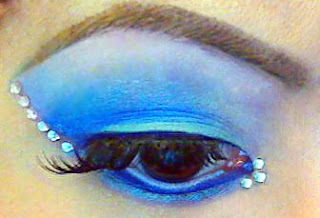 On my eyes, I used white and a lot of baby, icy blues and I also added some rhinestones and lashes of course. For the lips, I iced them over by using the porcelain foundation, Hush Cream Color base, and Baby Sparks Dazzleglass. I extended my eyebrows out a bit so I could bring the color wayyyy over. Look at the difference between my face color and hands, lol. Thanks to my BF for jazzing it up and adding winter trees in the background, lol. It was really fun. I also used my same septor that I used for my Queen Bee video. Who would have thought that I would use my $3.00 Wal-Mart princess kit so much, lol. This looks is RIDICULOUS! AMAZING. I'd rock this out somewhere. Thanks for the inspiration and please do that review of the colors you used. Those blues are SICK! WOW, WOW, WOW. Your look is amazing. I hope you do a tutorial on it. It is beautiful. I can also imagine it in green, red and gold. Even purple. Ren you are truly gifted. Oh my gosh..you really do look cold. i love it ren!! 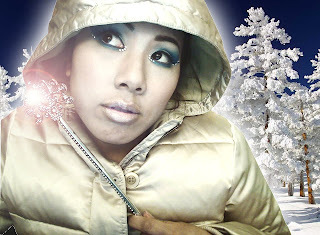 and your gold puffer ;) ice princess indeed! this is the cutest most pro contest entry that i have seen for a contest thus far my gosh its gorgeous!!! wow! love it. Damn girl your make up looks amazing like always! I wish I could do that. girrrl, i LOVE this blue. i have a thing for blue eyeshadows even tho' it looks funny on me. EVERYTHING looks good on you!!! Girl! you did the makeup so good! and i love how it was complete with outfit :) :) :) and photo design! love it..goodluck!!! you did an amazing job!! btw, is you jacket steve maden? I bought one that looks just like that a week ago! Wickedness! This is serious. Really captured the theme at hand. Can I say gifted or what? stunning - going have to borrow this for my xmas do! Did you use surgical glue for the crystals?